42 people think this report is great. 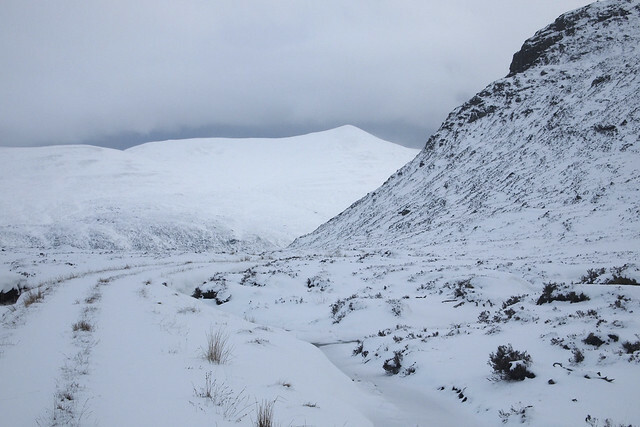 Thanks to WH members, Geograph.org.uk, Scottishhills.com and lots of other sources a nice 9 day walk was conceived. 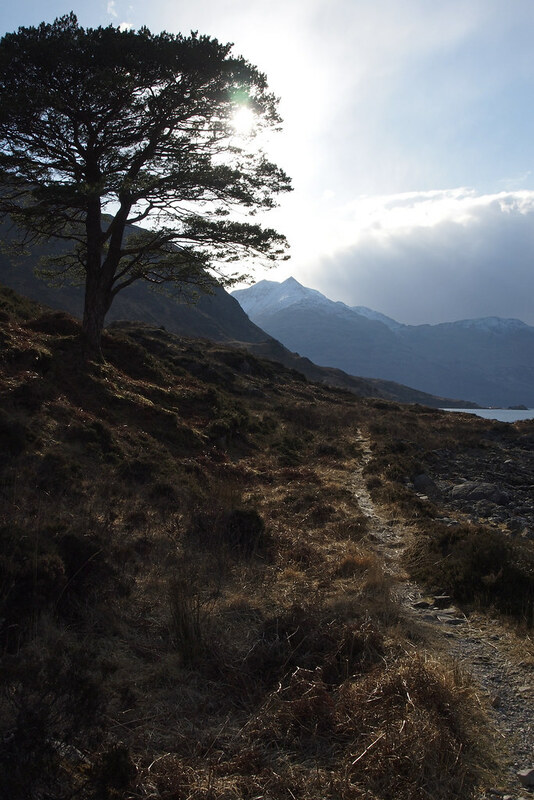 A plan is one thing, the real walk quite something else, and the writing down of it creates yet another incarnation of the same old recipe: connect different landscapes of Scotland by a route that can be altered on the go. 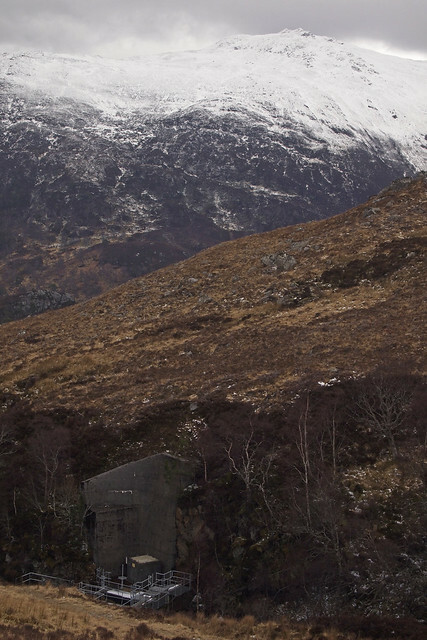 I'll now try and write something insightful about my latest sounter in the Highlands. This year's trip starts in Achanalt on the Kyle-line from Inverness. My friend Paul drops me off there. 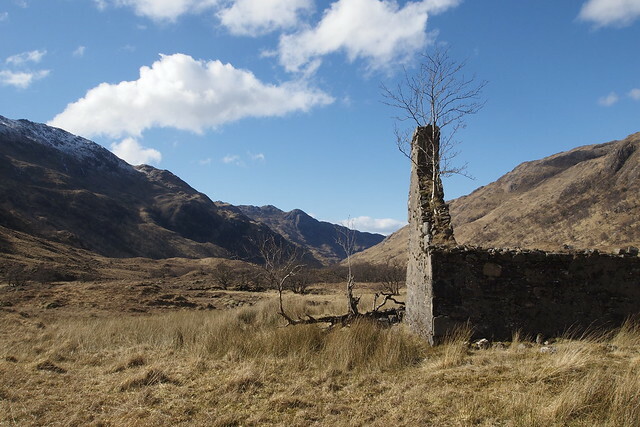 The walk from the railway line at Achanalt to the base of Sgurr a'Choire Rainich is staged to slowly switch from '500 yards is far' and 'three flights of stairs is high' to '20 miles is far' and '914 metres is high'. 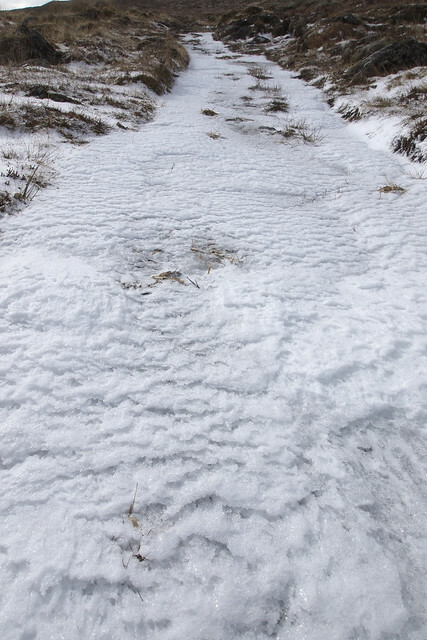 'Snow is slippery', 'below freezing is cold' and 'I really need network coverage' go out the window as well. Seems each office-dweller has a set of reflexes and senses stored somewhere in the brain that are activated the first day on the hill. I'm adjusting while my feet are already happily trotting away. 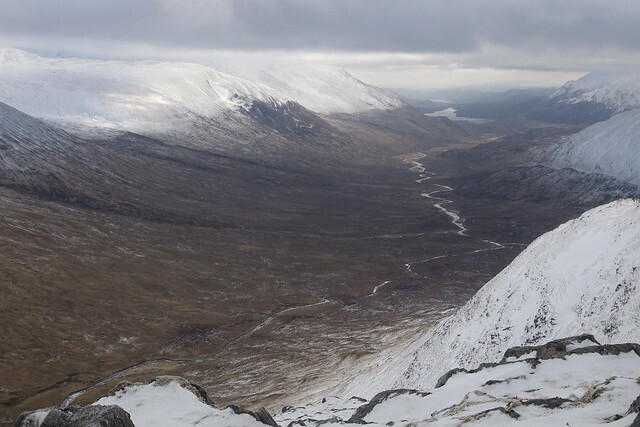 For the Strathconon Corbetts, Hamish Brown claims: "admire from Strath Bran, climb from Strathconon, except if you have a fetish for flogging miles of boggy moorland". 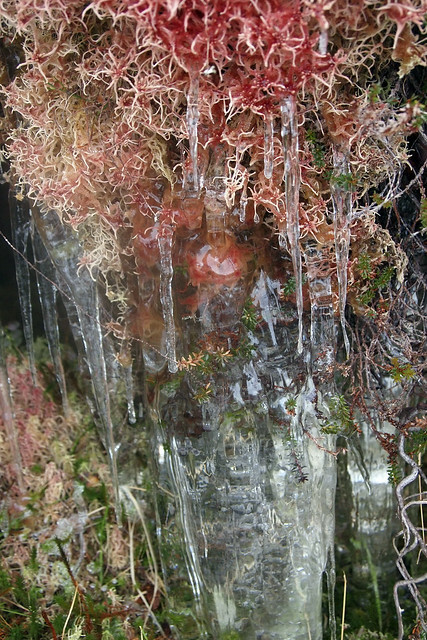 I do have that fetish, but luckily enough, all bog is frozen. All nine days of the trip. I put on my merino longjohns. To keep them on for almost the full nine days. 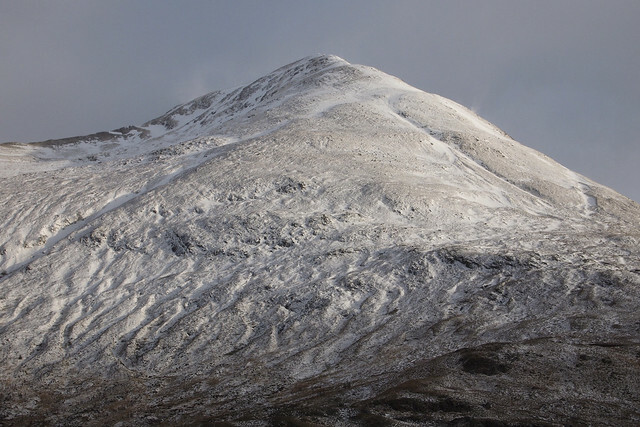 Seen from the railway line, Rainich looks high, of textbook shape and very frosty. 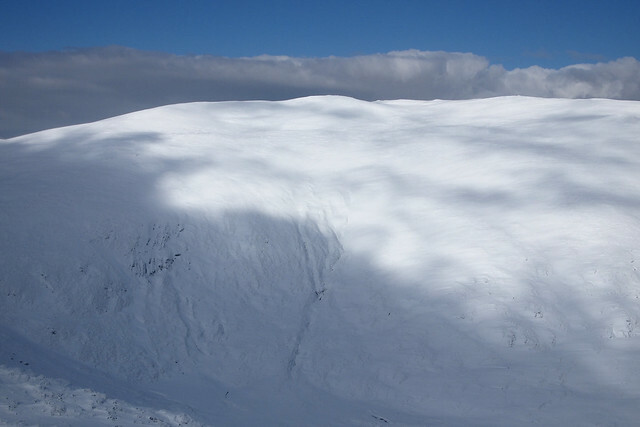 Its eastern corrie, the one I use for ascending, is filled with snow blown in form elsewhere. Fine views. 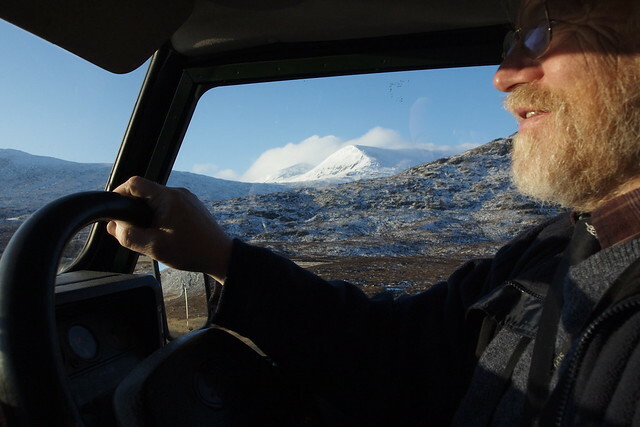 To the north are the Fannaichs, northwest is Torridon, northeast is Wyvis. The blue sky of the morning is always gone by midday. Today is no exception. 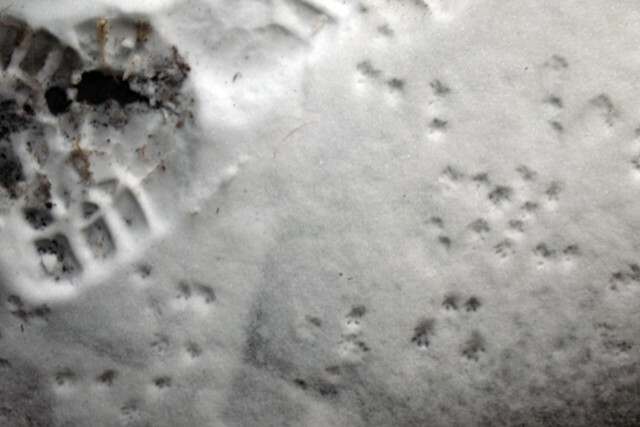 Mental note 1: in snowy conditions, avoid leesides of things since snow accumulates there. Mental note 2: in windy conditions, look for leesides. The devil adds up these two today. 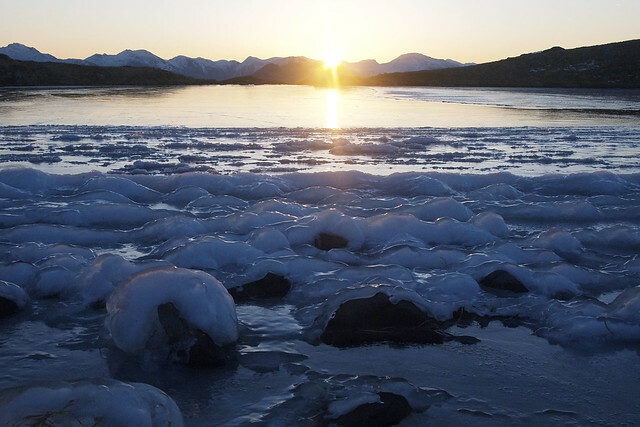 "In conditions that are windy AND snowy, choose freely between floundering and getting rattled". 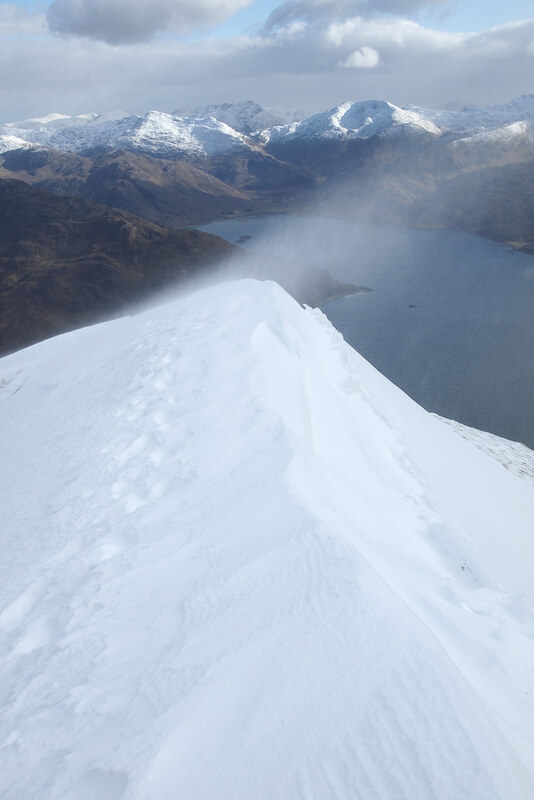 I choose wind over snowdrifts and forget about contouring to the saddle between Meallan nan Uan and Sgurr a'Mhuillin. The shape of this mini massif is not very clear to me at first. 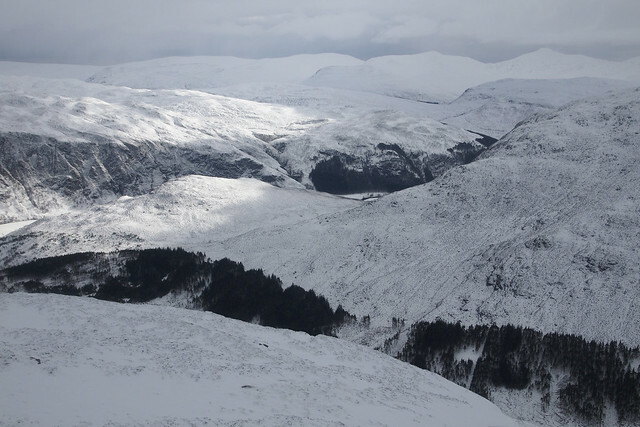 I find the eastern ridge, and follow it to Mhuillins cairn. Meallan nan Uan is more of a hill. Better shape, steeper, and with better views west and south. The view is nearly black and white. Snow, dotted with dark trees, cut by a dark river. Not a soul to be seen. On the horizon are the Strathfarrar Four, and to the west Maoile Lunndaidh & Co. Some hills are new to me, like Bac an Eich. True to habit the first day is too long, nine and a half hours. Pouring over maps and reading bluesky-TR's this winter has again simplified things and made any route seem possible. Reality moulds the route into something more feasible. Day two: Strathfarrar Four, Three, Two ... One. 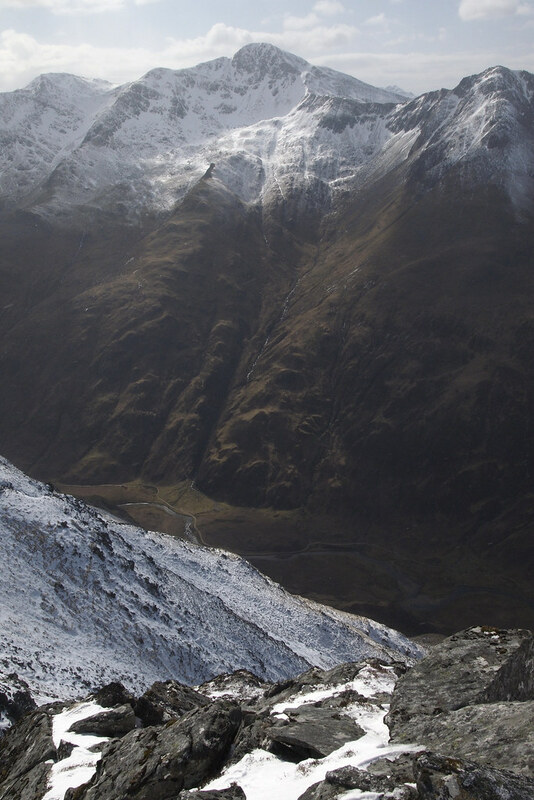 Many times I've imagined how I would succesfully ascend Sgurr Fhuar-Thuill and walk east to do the other three. And proudly post a trip report "Four from the North". This hybris will be rebuked today. 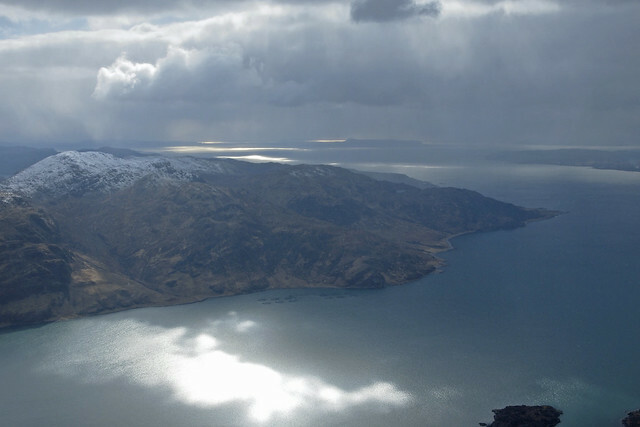 In the morning, after re-reading the MWIS forecast on a PDF I've reduced the number of munro's planned to one or two. 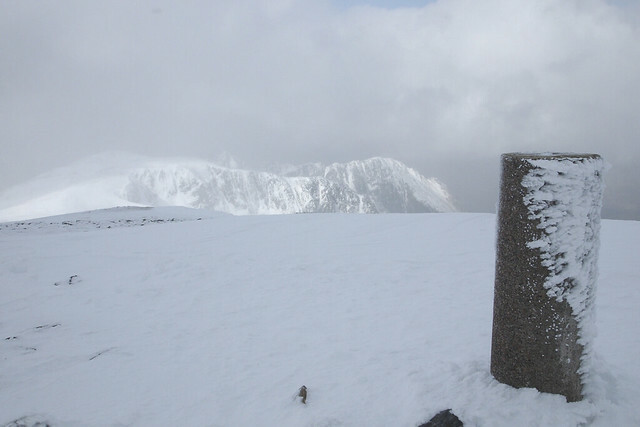 Once on Carn nan Gobhar conditions leave nothing to the imagination. In fact, they leave only one option: out of here. And don't even think of walking into the wind. (MWIS predicted 75 mph gusts and a -22 windchill; as far as I could tell, it wasn't far off). I check my position using the NavigX app and leave. Or rather, I'm being blown west. Cheekbones and nose hurt from the stinging cold and the flying particles. 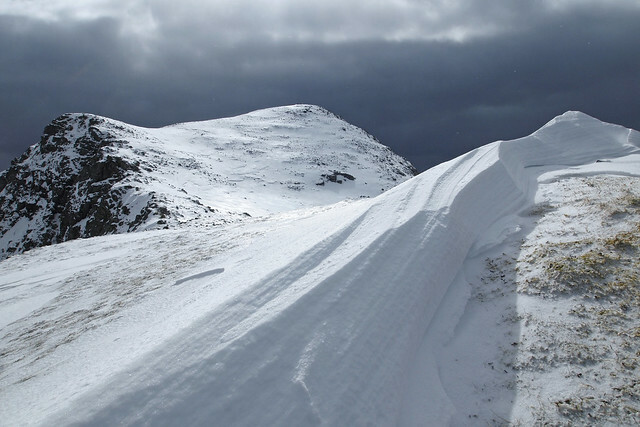 Leaning into the wind sideways brings me out onto An Socach, a gentle way down on crusty snow. 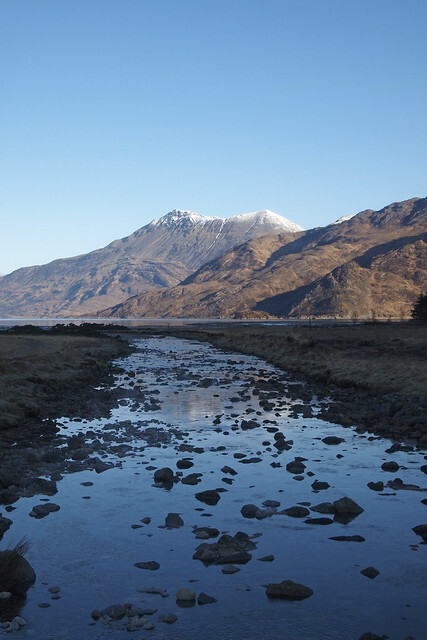 Of course any An Socach is a snout, a spur jutting out into the glen with a steep front. This steepness is welcome, the sooner I'm down, the better. During nine days I've only seen one couple of walkers, on day 6, from a distance. Some conditions begged for an encounter with some cheeky fellow hillwalker to take away the intimidation presented by high winds and bitter cold. And I made a mistake: the route on day 2 didn't have a low level alternative (other than walking round via the Monar dam). 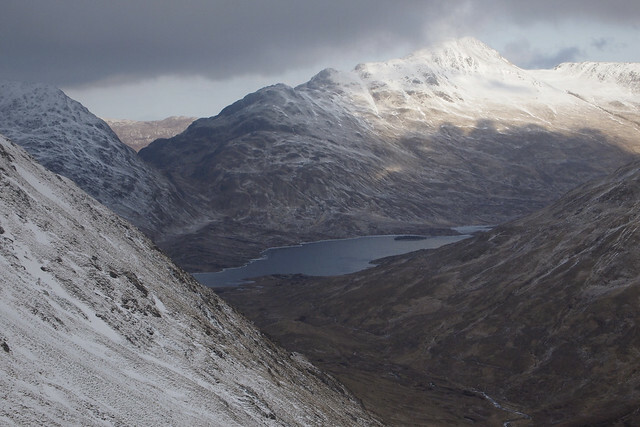 Sgorr na Doillaid has my sympathy since 1998 when I first walked Strathfarrar. Being a Corbett it is quite far away from the higher hills on the same ridge. Two conspicuous horns keep it out of the whaleback-category, and the northern side is steep enough to have the summit visible from the floor of Glen Strathfarrar. As expected, even an 800m hill is rasped by winds. 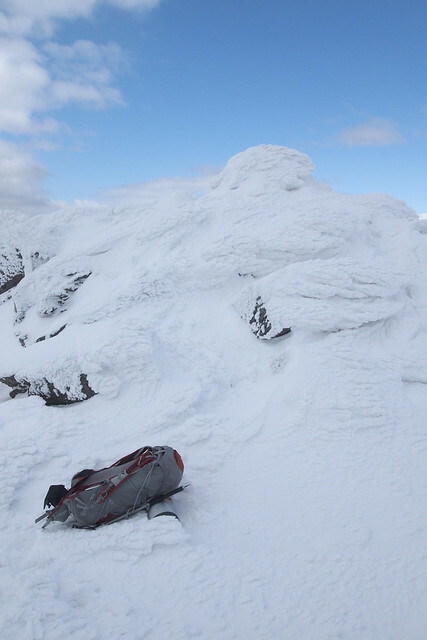 I'm unpleasantly surprised by the stark appearance of the ice-clad summit rocks: some scrambling is unavoidable. 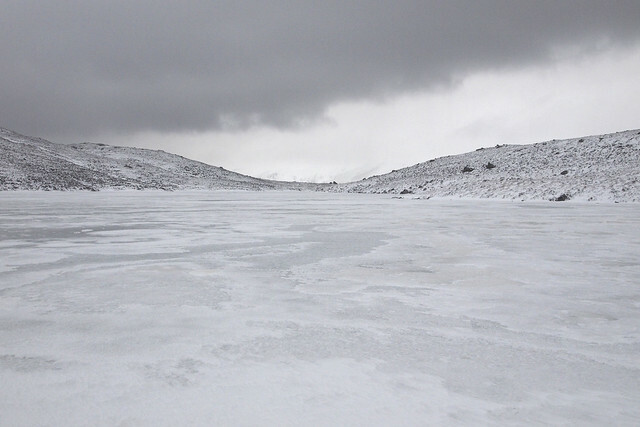 Today I'm on the other side of the thin line between fear and audacity, so I scramble up over brittle ice. I utter a covert 'woohoo'. Good thing I marked the peat hag my rucksack leans against digitally and with my ice-axe on top, for, not unusual, on return I looked for it far more to the south. 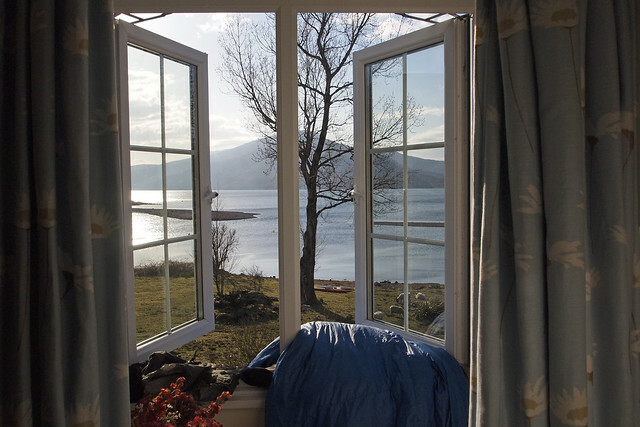 The new MWIS forecast PDF I downloaded in Cannich predicts a less windy sunday. 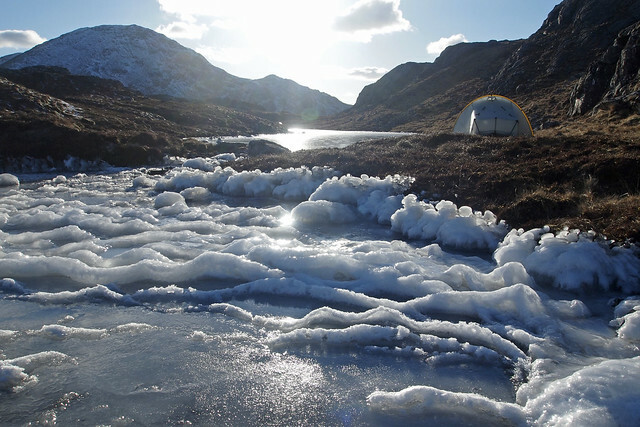 I'd like to camp in Gleann na Cailliche and from the camp do "some" (I dare not say five) munro's. This well prepaired plan is foiled. It freezes 7 degrees on the glen floor, the path is icy, and just look at the ridges around, outlines blurry with drifting snow. Conbhairean is a white fin, jutting into the storm. Danger. I shiver, not only from this sight, but also from a cold. One day has to be the lowest. 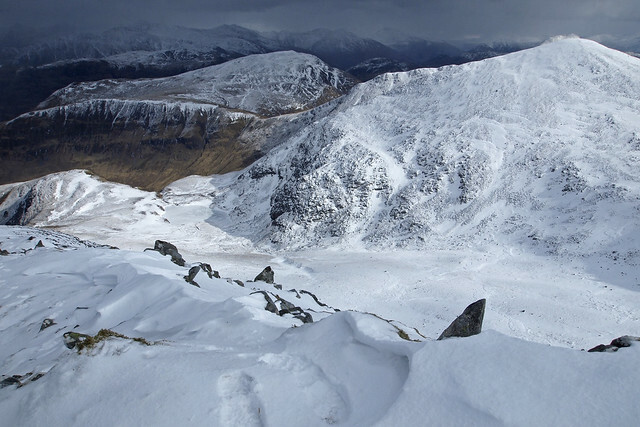 There's not many hills that have lived on my wishlist for as long as Beinn Fhada has. So, forget about boosting my munro number closer to 141 by climbing Ciste Dubh and the Brothers, loyalty prescribes Fhada is next. 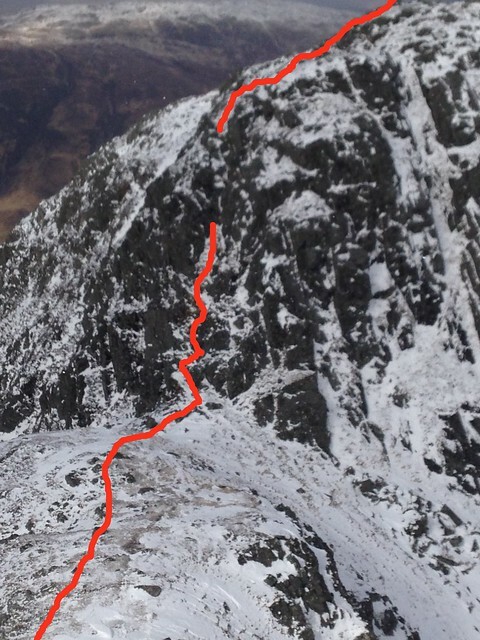 The east-west traverse is a grand route, Ben Alder-like at first, with a dash of Cuillin in the tail. Exhilarating ridge walk, and quite effortless negotiation of the bad step between Sgurr a Choire Garbh and Ceum na h-Aon-choise. 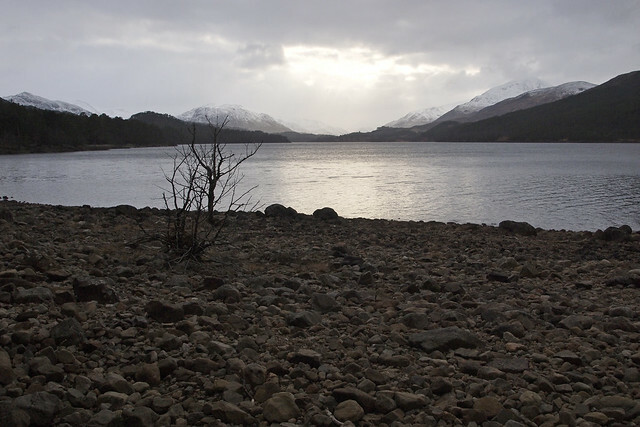 See a descriptive TR here http://www.walkhighlands.co.uk/Forum/viewtopic.php?f=9&t=30267. 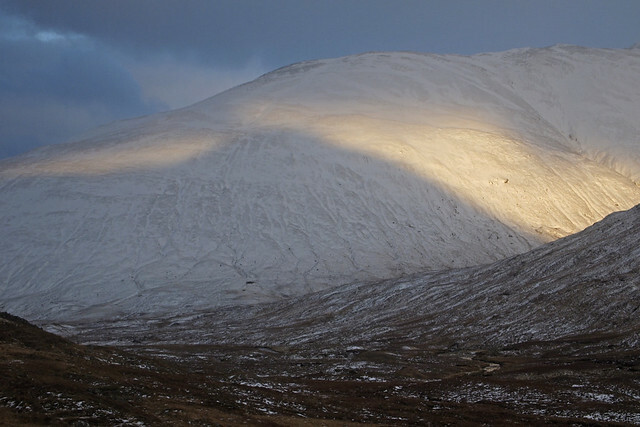 On Beinn Fhada the wind drops, and the sun comes out. It melts away my apprehensive alertness. The feeling that one can be on speaking terms with a winter mountain returns. Even though I am never really scared, the first three days fear came along every once in a while, to keep the option of turning back at the top of my mind. It's that fear that induces safety. It's a good thing, but I like 'audacity that generates fun and bliss' much more. 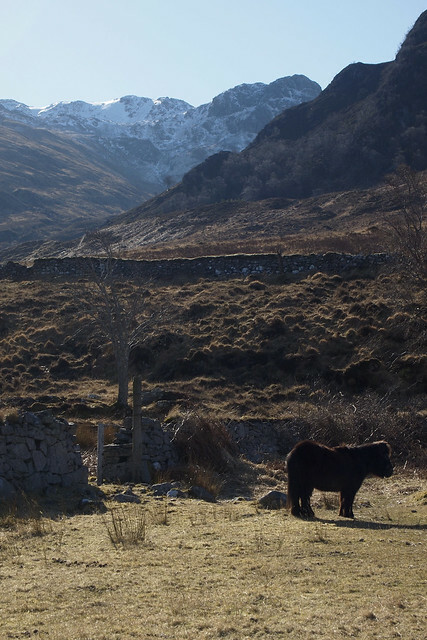 What charms me the most about Glen Beag is the way the road weaves on, curve after curve, every time revealing a new pasture, old wall, broch, farm or autarchic house. 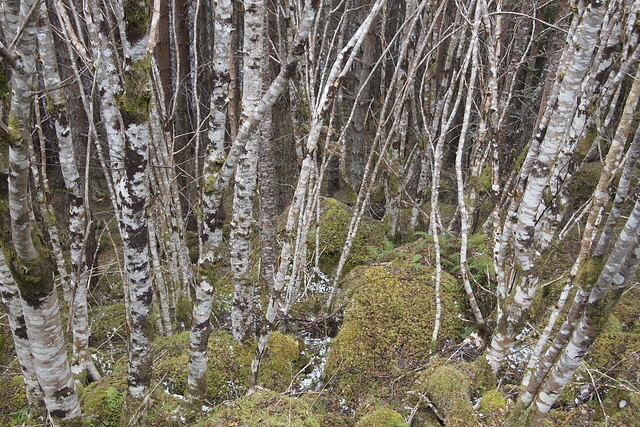 After Balvraid, a messy farm, the path slants upward to Dun Grugaig and turns a delightful moss-padded track in a birch wood. A DIY bridge crosses the river. Some mile on southwestward, the path peters out near a meandering stream. This is where my 'roaming' naturally ends. To go further would mean starting a climbing episode, so 'homing' takes over. 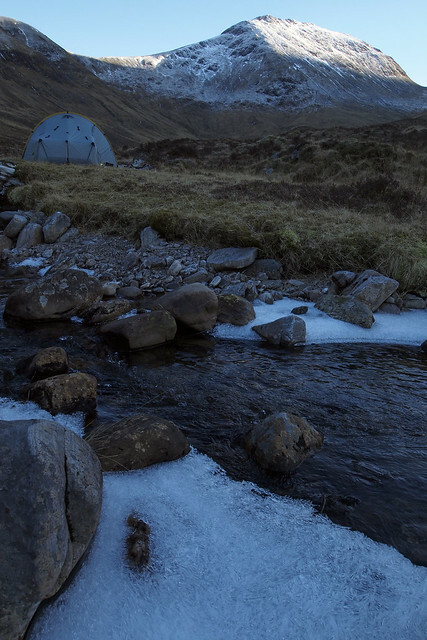 I wander somewhat further upstream, and pitch the tent in Roisdail, within sight of both Eaglaises north ridge and Sgritheall's northeast ridge. One hour later I set out for Sgritheall's northeast ridge. 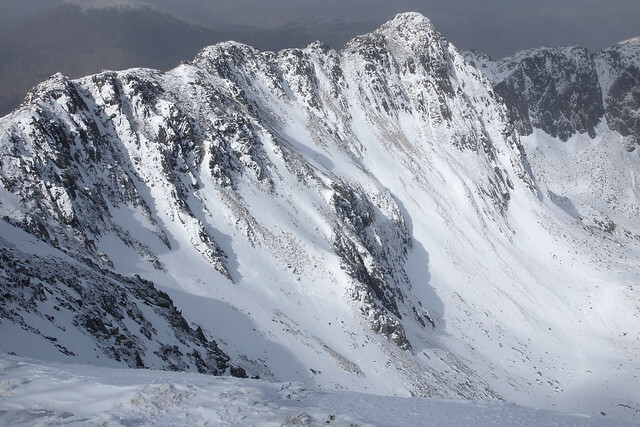 The weather turns grey and cold once more, but the sweeping zig-zag of the ridge is a grand outing nonetheless. On summiting Sgritheall the seaward view really jumps at me. Hurray for the sun making firey spots on the bluegreen sea. Surely, Eaglaise is bagged the next morning by it's north ridge easy-peasy. At 7.45 I'm on its summit. Swoop swoop. Lovely morning too, warm enough to take off the longjohns. Bealach Dhruim nam Bò is a special place. Something Cairngormy about it, and the idea that cows can be driven across it, is believable. 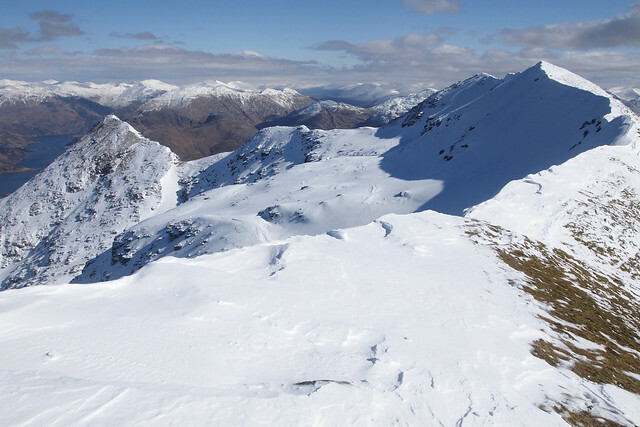 Beinn nan Caorach is a grey mouse of a peak, "it would look strange and flat if it weren't there" is all I can say to promote it. 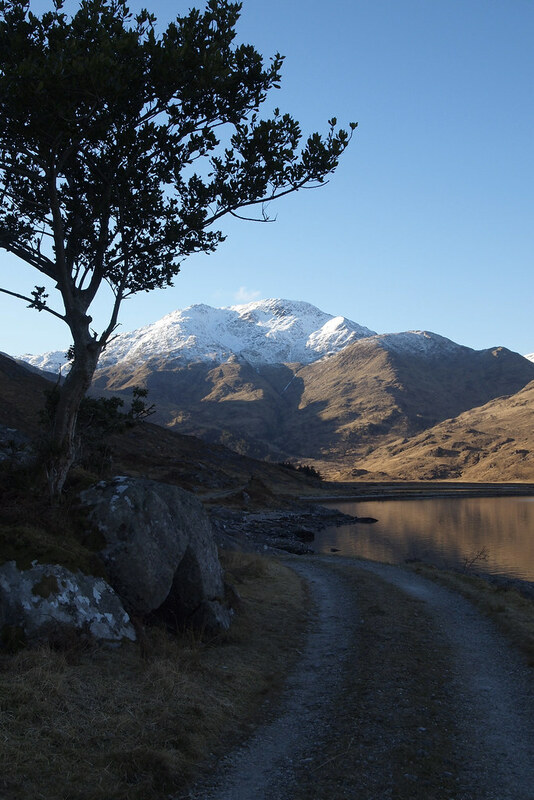 To reach Kinloch Hourn one goes down southeast from Bealach Aoidhdailean into a glen which is quite nice with it's deep lying river and trees and a peculiar T-crossing. But the rest of the way is no man's land, defined by the mountains that surround it. Featureless land with lots of stalking tracks. 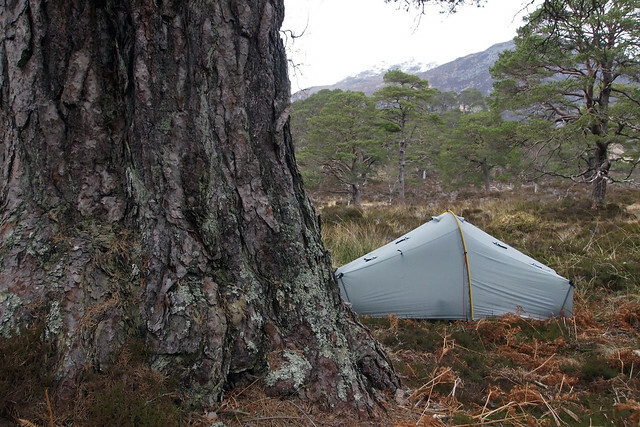 In the morning I strike camp at 6:30 and discover my ice-axe is missing. As far as I can reconstruct, I still had it on me round midday the day before. After lunch I must have attached it to the rucksack in the wrong way (after doing it right for 18 years). It could be anywhere between here and 20k back. I do no go look for it, since my boat-train-flight home is near. Ladhar Bhein without an ice-axe, is that okay? 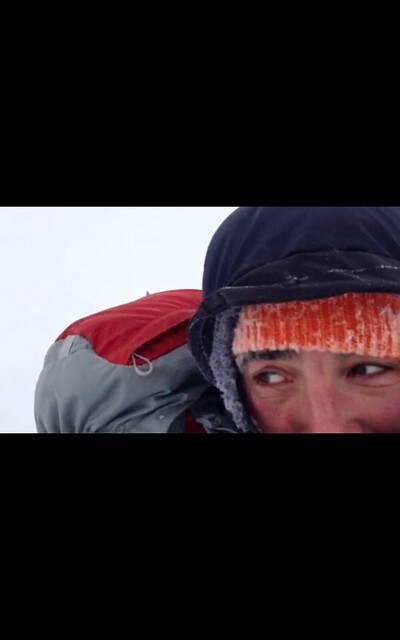 Crampons, but no ice-axe? Something I would frown upon, but I admit to stretching the rules a bit when it's me that's breaking them. 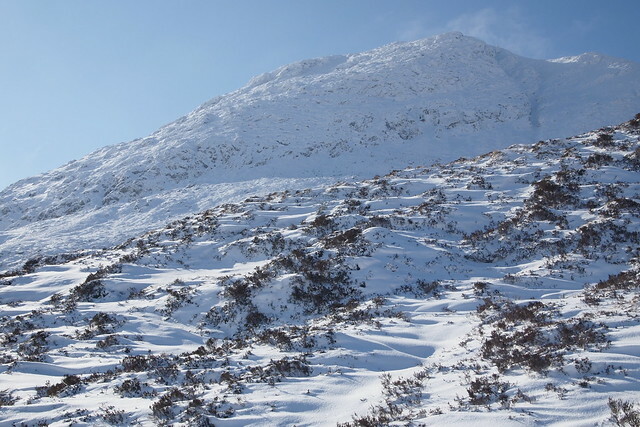 All former plans of walking to Li and climbing the hill from there are binned as soon as I come round the Barrisdale corner: Ladhar Bheinn looks glorious, bright white against the blue. 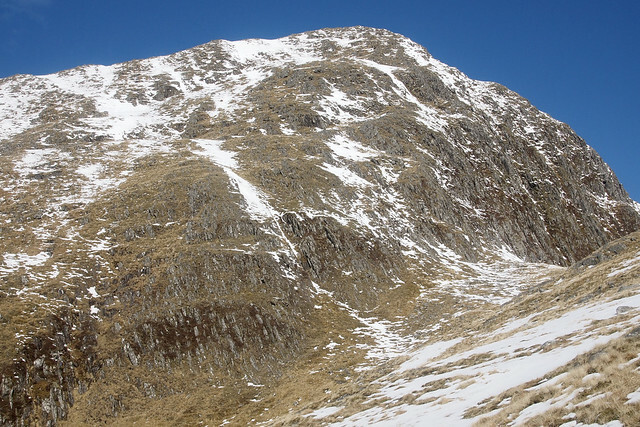 Stob a'Chearcaill puts me off a direct ascent, so I climb to Mam Barrisdale to try and circumvent the Stob. As could be predicted, I end up doing a harebrained climb up its southeastern flank, nails dirty from clawing at the steep grass. From a distance, this looked steep, but less steep than Eaglaise. 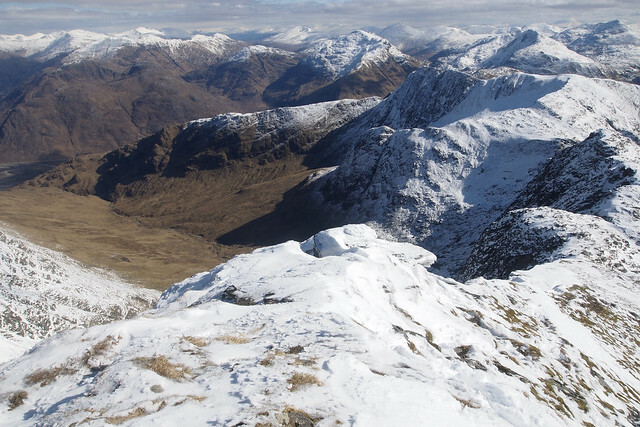 However, from close range the whole southeastern side of Stob a'Chearcaill has an apron of crags. Note: if you want to avoid climbing it straight from the northeast, go round the southeast side at least as far as the stream. 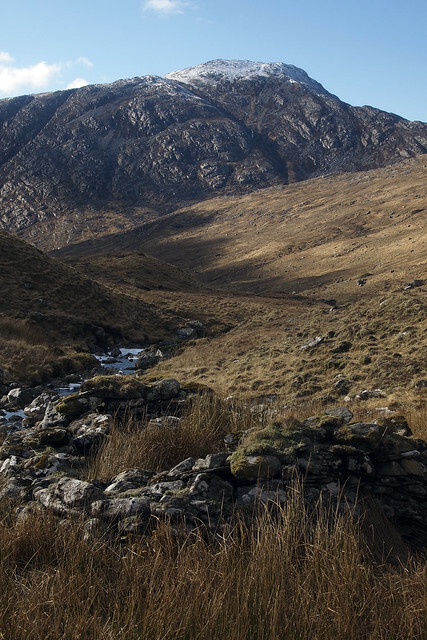 The south bank of the stream is the way up if one wants to avoid the Stob altogether. Upon gaining the summit I want to rest and walk around for the views, but the summit is so narrow, Coire Dhoircaill starts with a huge drop one step away. Jellylegged I continue to pt 849 where I can relax on a domey top. Next is the ascent of pt 858 which looks daunting from a distance. I eat my last three shortbread fingers. 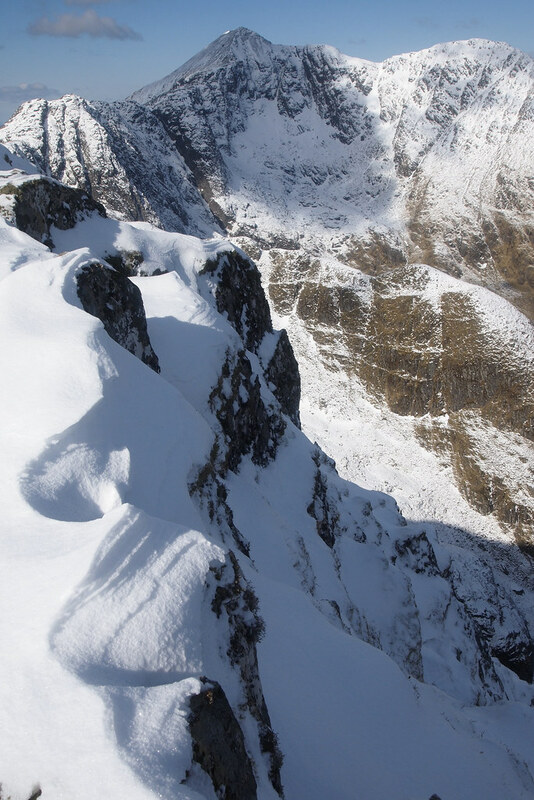 Gentle zigzags lead trough all difficulties, and after climbing the last rib the main summit ridge is gained. I feel really good sitting at the trig point, make a pano-video of the view and text home that all is well. 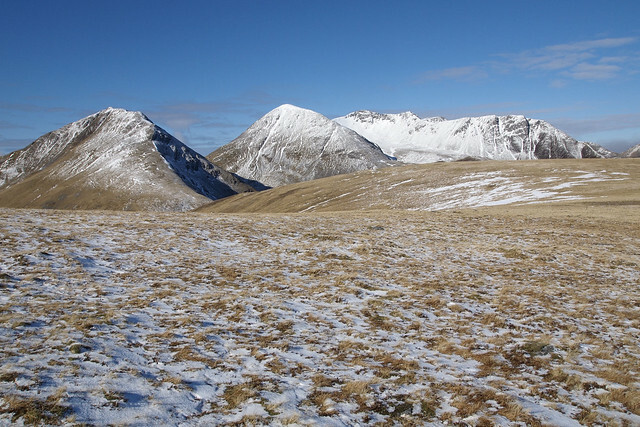 Ladhar Bheinn, Sgritheall and Beinn Fhada have something in common: bland southern slopes, complex northern corries. No sooner do I leave the summit ridge at its southwest exit or I slip. Hoar frost fingers have melted and refrozen and the whole surface is dotted with shiny pearls of ice. 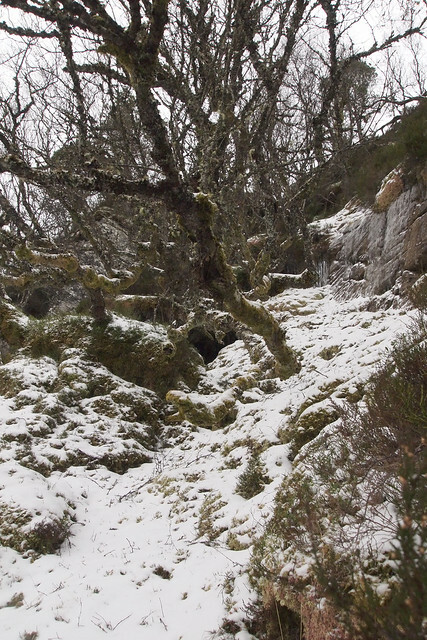 Crampons back on, to walk crunch crunch downstairs towards An Diollaid. 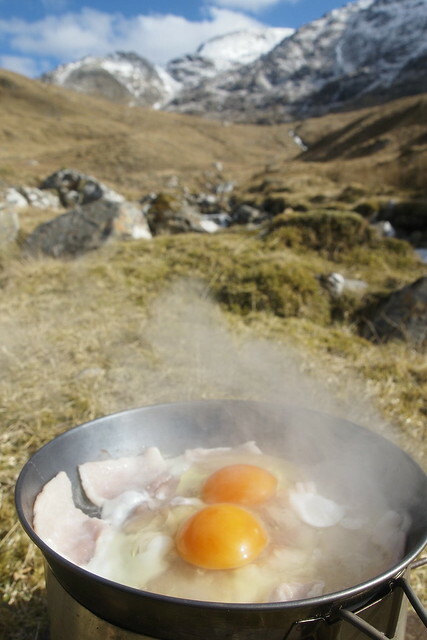 There I make a right turn into the cold northern corrie, the fastest way to flowing water and a well deserved midday fry-up. Before sunrise I'm up to take pictures (you know, first thing when you open your eyes is the bladder alert, you have to hurry so why not bring the camera out). 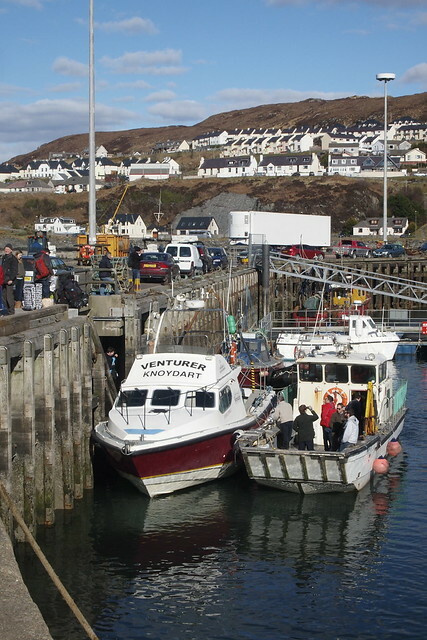 Inverie has boomed since I'd last been there (1995) with a big pier, a taxi and much more accomodation. 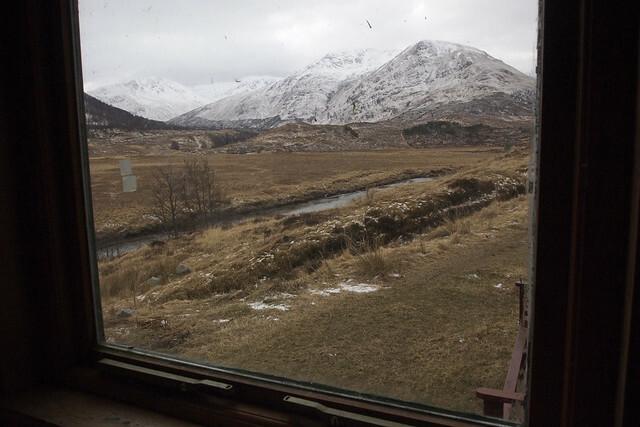 In the Knoydart Foundation office I read an A4 nailed to the message board: Clive Dennier is missing. Today (March 29) they found his car, the Volkswagen I saw. This explains the mooring of an orange rescue vessel. It delivers some 6 mountain rescue people. I halt the landrover transporting them to report where I've been and what I've seen (no trace). If they find a purple and alu ice axe, it's not his, it's mine. I'm rather shaken. This man is me. 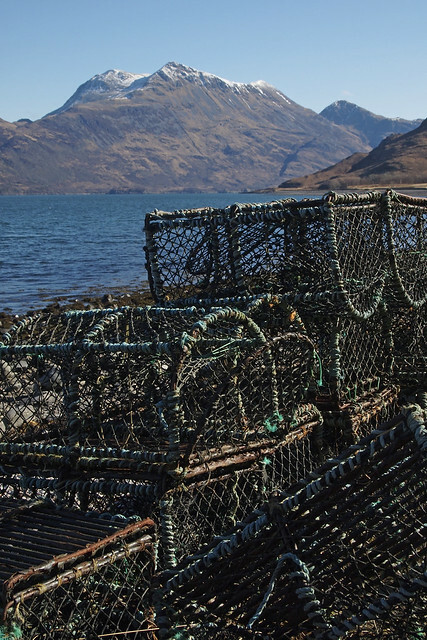 A solo walker in Knoydart. Clive Dennier still wasn't found when I write this. 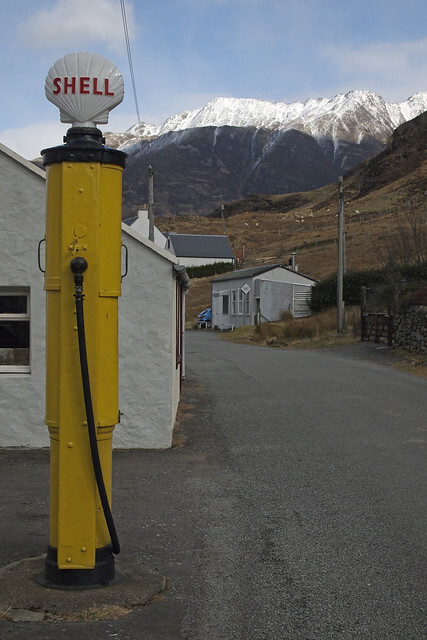 In Mallaig I visit the swimming pool, the chip shop, the giftshop, the supermarket and a hardware store (to buy fresh socks) and the train station where the evening train to Edinburgh awaits. Unrolling my mat at the airport at 02:00 is a contrast to wild camping that is hard to handle. This year's newcomers are a merino pair of longjohns (Rab MeCo120) which are impressive. Superlight, warm, no smell. The gear to go out the door next year is my pair of waterproof gloves. Point is, the inner liner comes out when you pull your hands out. When puttin them on when really needed, I fidgeted with the liner for ages. Very annoying. 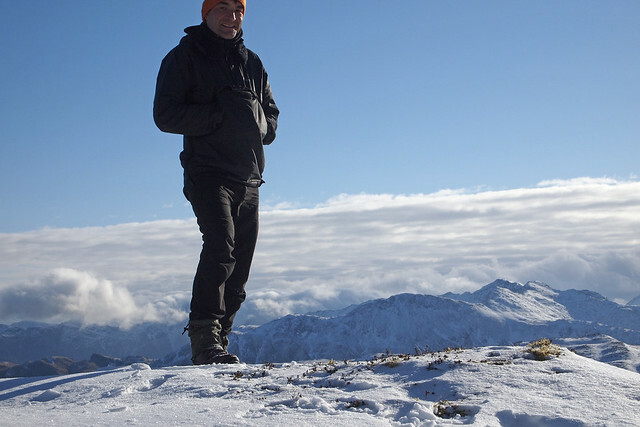 Mainstay is my Montane Extreme Smock. Where would I be without it. My 8mm foam matress might go next year. Warm enough, and very light, but I might switch to Neo Air or similar, heavier, but more comfortable. This year saw the exit of all things too sugary. What I do is for diesels, no peak performance so no 'sugar highs' needed. The body burns fat and slow sugars, and switching to the fast sugars of jellybeans etc is uncomfortable. Cheese is favourite, and canned fat fish. Note for people who cannot squeeze cold honey or syrup onto their porridge: use raisins. They sweeten the porridge and keep heat quite long. I didn't do any measuring while underway. 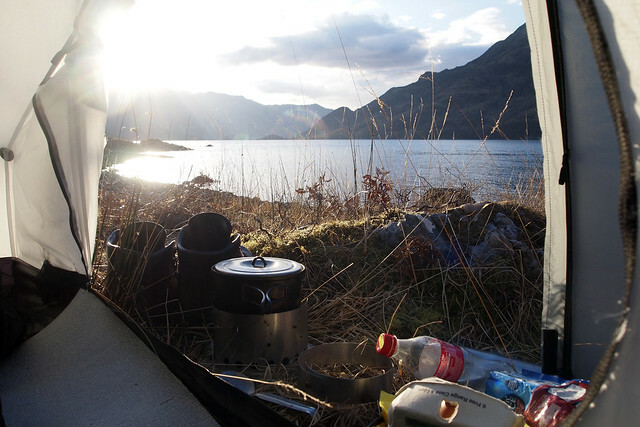 No alarm clock either, just went to sleep in the last light (19.30) and got up 06.30 which gave me long days. Distances and ascent are measured on 1:25.000 maps using WH's GPS-planner. Real distance probably a bit more, but who cares. Last edited by Klaasloopt on Tue Apr 09, 2013 7:49 pm, edited 2 times in total. A classic. Superb journey, tough conditions indeed for the first section. 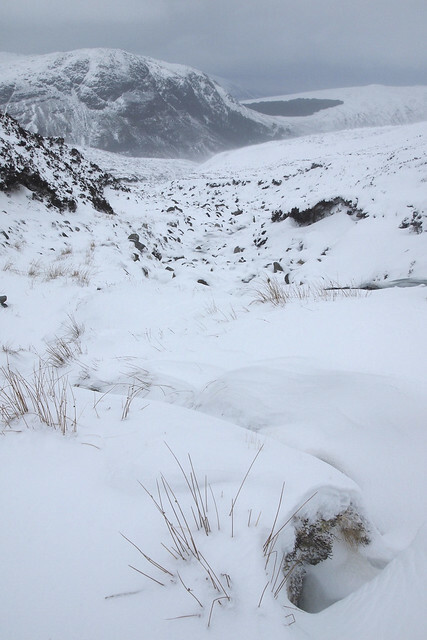 Can really taste the fear at the sheer wintry wildness of the land. And what a choice of book to listen to when walking - I love macfarlane's writing. 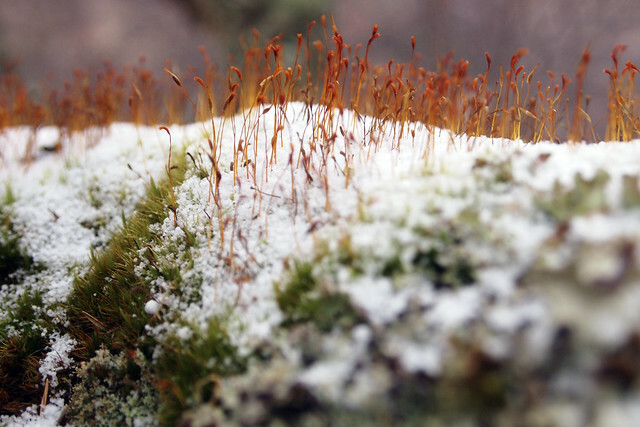 Excellent report - loved many of the photos including the macro 'Micro forest on snowy hill' and your descriptions! 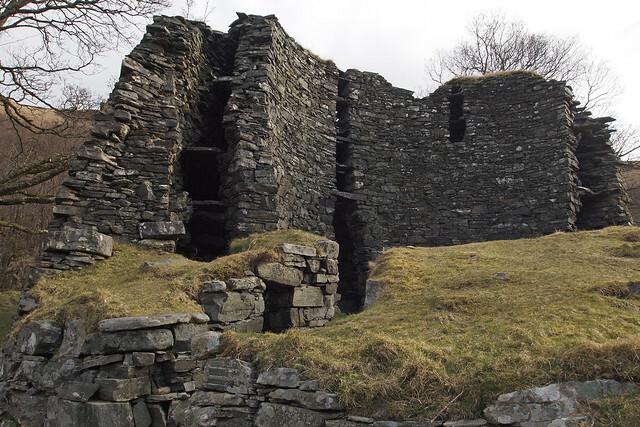 Glen Beag looks like a fascinating place to explore. Everything looks impressively snowy. Also the weather out west looks better - I'm sure it was grey and windy in Inverness for the entire time you were out. What a trek, stunning stuff loved reading it and the pics are braw anaw! Another epic! I always look for your trips...exactly my type of thing as you know, but theres a big BUT, I'm not that hard!!! A rather cold welcome from Scotland for you this year. Another epic encounter,great read,many thanks.